The new Sight Master Sight Pusher Tool is beefier and more robust than any Sight Tool on the market today. Notice how big the main screw and bolt are compared to anything on the market. It's fully adjustable to accommodate most modern handguns, both front and rear sights. *Please Note: This Sight Pusher tool may not be compatible with certain Ghost Ring style sights, or other "Extra Tall" sights. First, the price....at just $60 this tool is affordable enough for everyone to have in their shooting bag. Second, the Sight Master is designed to be used with a wrench or socket set, so you can get much more leverage on this tool that traditional hand tools which makes removing those tough rear sights much easier. And, third...did I mention that it was just $60! 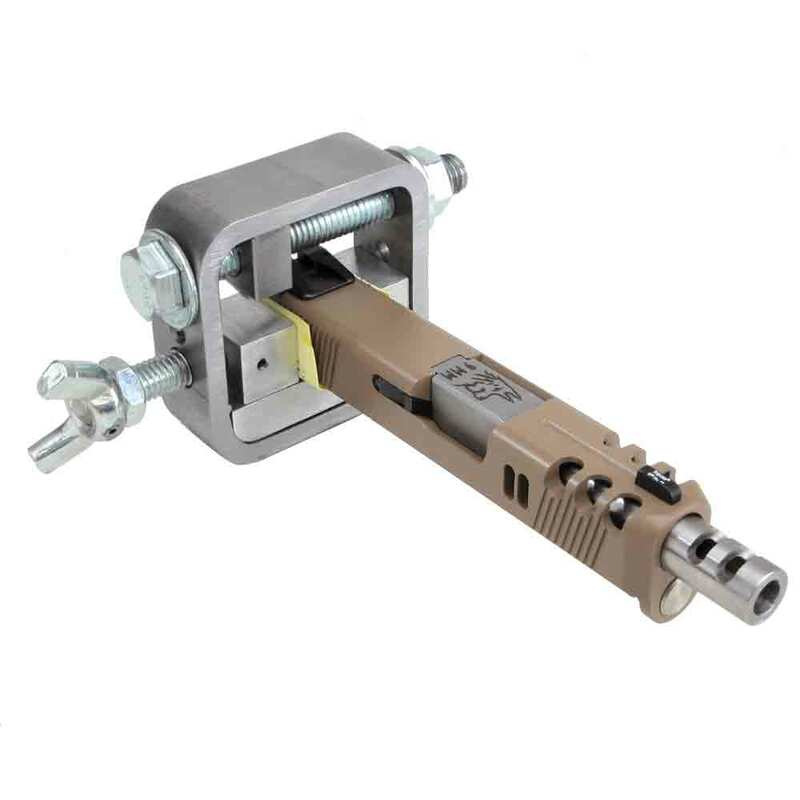 The Sight Master Sight Pusher Tool is adjustable and comes with a two sided hardened steel pusher...one side is angled for Glock sights and the other is straight for 1911, XD, Sig sights. I would give it 5 stars for being an affordable, working sight pusher, except that even using a piece of fabric or cleaning patch does not completely take care of the rough nature of this device. It will likely still mar your slide or sight regardless of what you use in between. And putting fabric in can also screw up your view into the viewing ports, making it even more difficult to work with. But, it will get the job done one way or another. I purchased this off of Amazon and received in a timely manner. I used this to install Truglo TFOs on my 19 and it worked just as described. Make sure you line everything up, use a good piece of plastic (I just happen to have some delrin from work) so as to not mark up your slide. Removal was very easy and straightforward, installation took a little adjustment and one may need to remove the side block to fit the TFO rear site in. Installation took about 15 minutes. Does what it says, very pleased. excelente herramienta para cambio de miras, fácil de usar .